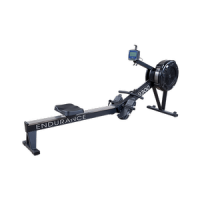 The Used Matrix Rower has an aluminum extruded slide rail and distance mimic real rowing feel. Adjustable monitor arm for compact storage. Flexfoot footrests adjust for quick and easy sizing. Compact storage: Machine separates easily into two parts for transport and storage. Easy assembly. Tools and illustrated instructions included. The WaterRower Digital (Chest Belt) Heart Rate Transmitter uses state of the art ANT+ wireless technology to communicate with the Digital Receiver (required item not included, see Accessories). The WaterRower Analog Heart Rate Transmitter Kit (Polar Chest Belt) sends heart rate information to the Analog Heart Rate Receiver Box (required second part of the system, not included in purchase of this item).